Technology is not likely the first thing that comes to mind when you think about a visit to the dentist, but you’d be surprised how much of an impact it has on every appointment. From precise diagnostic tools like digital x-rays to faster and more effective treatment planning solutions like digital impressions, the BGH Dental team puts technology to work in our office in order to provide the highest quality dental care. Call our team to find out more or schedule an appointment today. We welcome patients from Greenfield, Deerfield, and surrounding communities. Traditional x-rays took time to capture and develop, had to be physically stored and transported, and offered low definition images viewable only on a special light board. We use digital x-rays to make this diagnostic process faster, safer, and more effective. 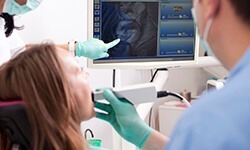 Digital x-rays are captured quickly and comfortably. There’s no need to develop these x-rays. Instead, they are immediately visible on chairside computer monitors. 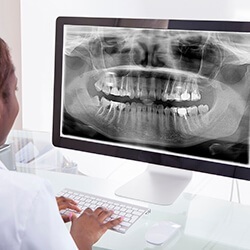 Compared with traditional x-rays, digital radiography creates higher definition images that allow us to provide more precise treatment planning. These digital images are stored and transferred via computer, and can be easily compared between appointments in order to closely monitor any changes or areas of concern. They are also immediately available for dental labs, specialist practices, and insurance providers as necessary. Traditionally, bite impressions were captured by having patients bite into a goopy putty. This created an impression of the teeth that could be used by a dental lab to create a customized restoration like crowns and bridges or cosmetic solution like porcelain veneers. 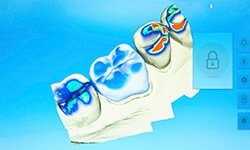 Impressions can also be used in treatment planning for orthodontic care or tooth replacement. Traditional bite impressions were physically packaged and shipped to a dental lab. This could delay the creation of the custom restoration by days or weeks. That’s why we use digital impressions. Not only are the digital files instantly transferable to the dental lab, so they can begin crafting the custom restoration right away, they are also able to capture more precise impressions of teeth. We use both the Cadent and CEREC digital impression systems. Lasers aren’t just for science fiction books anymore. We use both diode and Biolase lasers on a regular basis in our office to perform a wide array of treatments more quickly and comfortably. Laser is actually an acronym that stands for light amplification by stimulated emission of radiation. That’s a complicated way of saying lasers are high intensity light waves. These laser lights are used to painlessly remove damaged, infected, or just excess soft tissue. Lasers can be used to decontaminate smiles following periodontal (gum) disease pinpointing and painlessly removing bacteria, plaque, and tartar. We may even be able to use lasers to remove decayed tooth structure prior to placing a filling. This is a great option for those patients who dread the sound of the dental drill. One of the best ways we’ve found to improve the patient experience and better educate those we treat is to use intraoral photography to show them their smiles from the dentist’s perspective. Rather than trying to explain that patients have a cavity on their molar, we can show them a picture of their decayed tooth. We can then describe the treatment process with more clarity, so patients feel completely confident in their oral health care choices. Utilizing our state-of-the-art intraoral camera, we capture images of patients’ smiles quickly and comfortably. We can also use these images to help patients understand their cosmetic and restorative dentistry options. We’ll be happy to show you before and after images of patients who have already transformed their smiles with us.